Discover how you can legally "steal" thousands of high quality books, images, photos and videos, and sell them for thousands of dollars without ever having to pay royalties or licensing fees! If you had an unlimited supply of content that you NEVER had to pay for, that you could use however you wish, that you could sell for 100% profit or give away as you see fit, I'm sure you'd agree that would be extremely valuable to you. Smart book publishers have been reaping a fortune from public domain material for decades. Now YOU can tap into the same sources and publish ebooks made from public domain content and claim your share of the public domain gravy train! It costs you nothing but a little time, you keep all the money for yourself, and it's all perfectly legal! In fact, you're actually providing a valuable public service. What exactly is public domain content? Where to find all the public domain content you'll ever need. How to cash in on public domain content! You want a little extra money . . . maybe you're going on vacation in a few weeks, maybe Christmas is coming up, or maybe you just want to go on a way cool shopping spree. So, you search through your public domain sources, find a good book, and then you go watch a little TV. You spend a couple hours formating the public domain book in a word processor and then convert it into a PDF format ebook. Then you take the dog for a walk and relax. You add a sales page for your new book to your website, including a Paypal button so people can buy it from you. Then you go hang out with friends, knowing you've just given yourself a raise. That's pretty easy. YOU could do that, couldn't you? If you wanted, you could also build a mini-site for your new book so you have two places to sell it from, increasing your income even more. Like I said, there is a little work involved, but it's still pretty easy. The nice thing is, once you know this system you can give yourself a raise anytime you want by repeating the process. Could Making Money Be Any Easier? If you already have a website you could actually have a new product up for sale in one day using public domain content. For just a few more hours effort you could build a minisite (sales site) for it and be making sales from a second site within a few weeks. ...is no longer a problem! Creating content from scratch isn't necessary—just use the content other highly talented people have created. There's nothing left to hold you back. You can make money online NOW! I do it, thousands of other do it, why not you? You CAN do it! Discover the Insider Trade Secrets of Exploiting the Public Domain! There are more books, images, music, and other intellectual properties available to you than you can ever use. We're talking MILLIONS of items! Public domain material is always free to you, and you're free to sell it to a public that doesn't know about the secret public domain underground. You're actually doing them a favor by making content they want available to them. Of course, you should be paid for your valuable service! You can do anything you want with public domain works. Sell it as ebooks and keep all the money for yourself! Sell it as print books—at no up-front cost to you, I show you how! Give it away to build a mailing list. Give it away as a purchase bonus to increase sales. Sell public domain images on mugs, t-shirts, hats and more—again, at no up-front cost to you, I show you how! Start your own online book-of-the-month club—collect recurring monthly membership fees for content you don't even have to write! Use it as website and blog content—you'll never lack content again! Sell public domain content without changing it, or use it as a starting point to create your own one-of-a-kind exclusive products that you can copyright for yourself. You'll never lack inspiration again! Two Great Free Bonuses Included! You'll need a way to turn public domain words into an ebook, and with eWriter Pro you can easily make PDF documents. PDF documents can be read by both Windows users and Mac users, so you'll have a bigger audience than if you just make Windows ebooks . . . sorry Mac users, but this is Windows software. Not to worry though, I also show you a free alternate convertor inside Public Domain Profits so you can make PDF ebooks too. Not only that, but you even get master resale rights to eWriter Pro. That means you can sell this software yourself or offer it as bonus product and keep all the money for yourself! You can also authorize your customers to sell it with the same rights—you'll get more sales that way. I sell eWriter Pro on this page. Scientific Advertising, the classic book by Claude C. Hopkins, is considered by many to be the best primer on advertising available. It's been called the 'bible' of advertising by many top copywriters. Even though it's out of print, its timeless principles are as relevant today as they ever were. You don't have to advertise to benefit from this most excellentbook—it will help you understand buyer motivation so you can create cash generating sales copy! That's why top copywriters all over the world praise this outstanding book. The public domain is truly a treasure trove of free material just waiting for you to take advantage of and profit from! Public Domain Profits is only HOW much? You might think an ebook that shows you where to find high quality free content and how to make money from the free content, plus PDF making software with master resale rights, and the out of print "bible" of advertising would really set you back a bundle . . . but you'd be wrong! While I could easily sell this collection for $47.00 to $57.00, maybe even more—after all, with what you learn you can quickly make your investment back—I'm going to price it at less than what I think it's worth in a marketing experiment to see if I can make more money by taking less profit per unit but make up for it in volume. Be aware though, that if selling in volume isn't working out I'll raise the price without notice! For now though, you can get this entire package for just $27.00—and I'll guarantee your satisfaction or give you your money back! Yes—I want Public Domain Profits right now! I understand I can instantly download the 57-page PDF format ebook as soon as my order goes through. Public Domain Profits comes with a 30-day money back guarantee if you're not completely satisfied. Start cashing in on your share of public domain profits today! 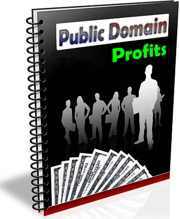 Public Domain Profits is just $27.00 if you order today. Click the Buy Now button to get YOUR copy and get started today on your road to legally cashing in on other people's creativity! PS: Remember, with a 30-day money back guarantee the risk is all on me. You've got nothing to lose by trying out Public Domain Profits and pockets full of cash to gain! Give yourself a break today—you deserve it! How to know at a glance, with certainty, that a book is in the public domain. How to tell if a book has had it's copyrights renewed. The best places to find public domain material offline. How to find websites you can legally take content from and you'll have the authors' blessing from the start! How to monetize public domain material. What you must do if you want to copyright the products you make from public domain material. Did you know ideas can't be copyrighted? You may be surprised at what all CANNOT be copyrighted. A step-by-step example of finding a book in the public domain and turning it into your own product. Can you claim to be the author of public domain works? The answer may surprise you. Find out where you can go to have your digital books turned into print books at no up-front cost to you! Pay only for the books you buy, whether it's one or thousands. Very reasonable prices too! Find out where you can go to have public domain images (or images you design) imprinted on hats, t-shirts, coffee mugs, and more at no cost to you. Pay only if you want one. This site will turn your images into real products and sell them for you. You earn a commission every time they sell one of your "products" ...whether you drive traffic to your free products store or they do. Print out this handy public domain reference chart. How to find hot ideas. As long as you own a website or do any writing at all, what you'll discover in Public Domain Profits will help you achieve your goals year after year. You'll never be at a loss for ideas or content because you'll know where to go any time you're not feeling inspired on your own. You'll be able to come up with intelligent content on just about any subject you can imagine. In fact, there's far more content than you'll ever be able to use. Within the public domain are literally millions of books, images, sounds and more that you can re-purpose, re-package, edit, create into compilations, bundle together into huge premium-priced courses or collections, OR simply use "as is", and sell them for any price you wish . . . and you'll never having to pay anyone licensing rights, royalty fees, or to ghost write content for you! Whether your interests include romance, sports, business, relationships, home decorating, crafts, psychology, science, childrens stories, cooking, the paranormal, pets, religion or something else—from little known authors to legendary writers like Shakespeare, you will have tons of 'ready made books' that you can instantly sell for profit without ever having to write or hire a ghostwriter! You're only limited by your imagination, but I've included some really cool ideas in the book that I won't mention here in order to protect your best interests . . . if you're smart and decisive enough to grab a copy of Public Domain Profits today! Have you ever wondered what it would feel like to pillage a vault room of fabulous treasures, taking away bags of shiny gold coins and shimmering jewels? That's kind of what mining the public domain is like—it's filled with a vast multitude of treasures waiting to be discovered. Take the fantastic journey with me . . . throw the hidden doors open and enter a vast library of 'forgotten files' . . . walk through the endless hallways lined with bookshelves and treasure chests filled with long lost literary gold, vivid imagery, and more . . . all waiting for you so you can reap your share of easy public domain profits. If the world's largest library was right down the road from you, and you could do anything you wanted with the material in the library, wouldn't you visit that library often and take everything you could profit from? That's what the public domain is, the world's largest library of free content, and it's just waiting for you to exploit it for your own personal gain. I'm handing you the golden key to this library's front door . . . take the key and begin your awesome journey into public domain profits.